The Stingeries: Jason's Graduation Weekend! I remember three and half years ago Jason asking me if I had ever considered going back to graduate school. I looked at him like he was crazy (especially since I had just graduated while he had been out for a year). Me: "No. Absolutely not. A person would have to be crazy to want to go back to school." Jason: "Well... I've been thinking about it..."
Me: "Hmm, I'm not sure what's wrong with you, but right now while we don't have kids and you have the time I say go for it." 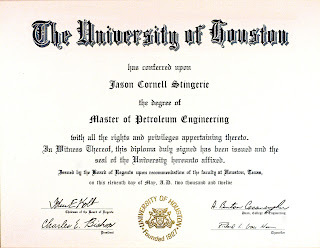 That started Jason's three-year long journey towards his Master of Petroleum Engineering degree from the University of Houston. Jason has been working full-time and taking 1-2 classes every spring, summer, and fall towards his degree. He has worked incredibly hard and I couldn't be more proud of him and everything he has accomplished!! So proud in fact that I started planning his graduation party almost six months ago... yep, I was almost (keyword almost) as excited for Jason to finish as he was! I've been planning for weeks and kind of went all out for his graduation party (as you'll see below in the pics!). I mean, how many times do you graduate with your Master's?! This entire week was spent getting ready for Saturday's party. We spent the morning running the final errands, meeting the deliveries, and setting up everything. I setup a display table inside that included his cap/gown, beautiful flowers that my dad and his wife Mary sent Jason, his cake, pictures from the graduation the previous night, his surprise gift, and best of all... Jason's fake diploma! Jason bought a frame to put his diploma in and I had the brilliant idea to buy a picture easel and display it during the party. I had the easel purchased and the empty frame sitting there by Tuesday when Jason says to me, "Um, Darcy, you know I don't actually get my diploma on Friday, right?" Me: "Say what?! I thought because it was a Master's you would be receiving it." Me: "Figure something out. I want a diploma in that frame by Saturday." Jason: "Can I just put a sticky note that says 'Diploma goes here'?" Me: [giving Jason a stern and intimidating look] "Figure it out." 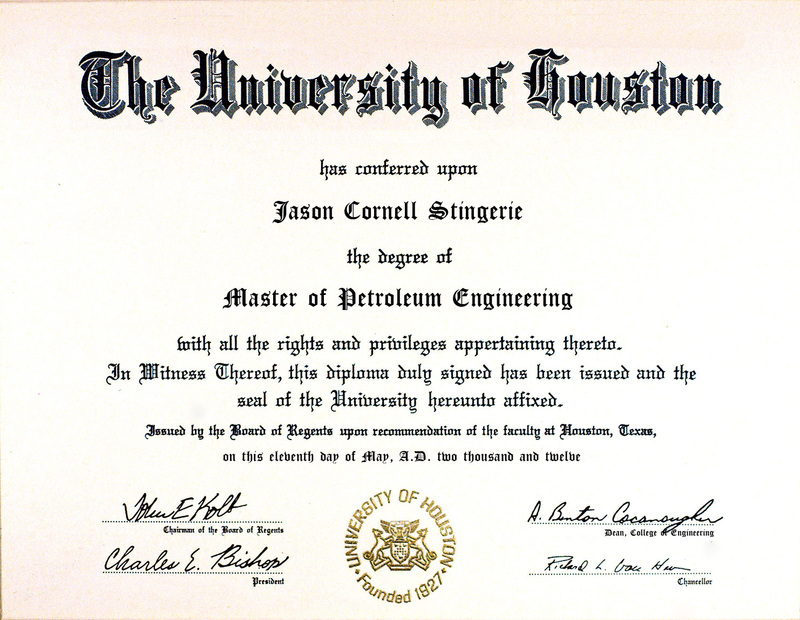 HE PHOTOSHOPPED A 1980's DIPLOMA TO MATCH HIS DEGREE AND NAME!!!!! I just looked at him and said, "This is part of why I love you so much." And proceeded to take the picture to the store to be printed on 11x17 ivory paper to put in the frame for the party. PK's (Preacher's Kids) - you have to watch out for them otherwise they'll float the keg! Jason cutting the delicious cake! We had a fabulous turnout and a ton of fun celebrating with our family and friends! Thank you to everyone who came out! A special thanks to my mom and Jeff as well! I couldn't have gotten everything done this weekend without their support! I was so glad to have them here and so excited that I could spend Mother's Day with my mom! Jason waited until today to open his surprise graduation gift: a GoPro camera he can use for car racing, cycling, and our upcoming trip to Peru when we hike Machu Picchu!! Jason - I am SO proud of you and everything that you have accomplished!! Congratulations again sweetheart! You are so amazing and work so hard!